large numbers of commercial transactions by Chinese companies outside of mainland China. Along with the enormous increase in Chinese companies investing and undertaking projects abroad and being required to provide a demand guarantee when doing so has been an explosion of litigation in China [to be updated with data when available] by companies seeking to prevent the bank that has issued the demand (independent) guarantee from doing so when the foreign party to which the guarantee has been issued seeks to be paid out under the guarantee because the performance by the Chinese company fails to comply with contractual requirements. It has also led to litigation outside of China, such as in the English courts. in a number of cases, Chinese courts have attempted to reinforce their own jurisdiction in multinational disputes by issuing stop orders to Chinese parties directing them not to make payment on negotiable instruments or guarantees issued in support of a principal contract which is the subject of litigation. In the case of a Chinese bank with international interests and assets and an international reputation,this puts the bank in a very difficult situation. 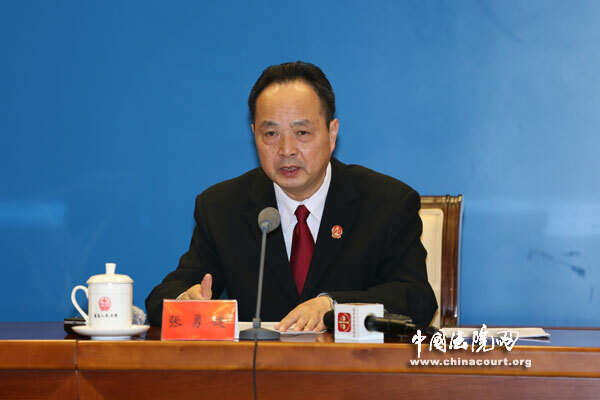 It is for that reason that Judge Zhang Yongjian, head of the #4 Civil Division of the SPC (responsible for foreign-related commercial/maritime issues) revealed (at the press conference at which the interpretation was released) that the China Banking Regulatory Commission (CBRC) and the China Banking Association have been lobbying the SPC to issue this interpretation quickly. (The drafting began in early 2013 and informal work began in 2012), while discussions about the issue date back to 2007 (if not before). A drafting group within the #4 civil division was responsible for drafting it). For those with no background about what these are, a demand/independent guarantee (called an independent guarantee in Chinese (独立保函), is often used in construction, engineering and many other types of infrastructure projects (and trade, such has shipbuilding and turbines), when the owner of the project requires the performing party to guarantee his performance with a guarantee issued by a bank. It means that if the contractor fails to meet his obligations, the project owner can be easily compensated. The bank guarantee generally needs to be backed by company funds. These are extremely important with so many Chinese companies focusing on infrastructure projects overseas, under the Chinese government’s One Belt, One Road and Go Global strategies and Chinese companies seeking to produce goods with greater added value, as Judge Zhang noted. The International Chamber of Commerce’s (ICC’s) Uniform Rules for Demand Guarantees (URDG 758) are the internationally agreed international standard on demand guarantees, having been officially endorsed by the UN Commission on International Trade Law (UNCITRAL) at its 44th annual session in June-July, 2011. The Independent Guarantees Interpretation sets out the applicability of URDG 758 in Chinese disputes, governing law, jurisdiction, and other issues and draws on it, the United Nations Convention on Independent Guarantees and Standby Letters of Credit, and other international rules. (Judge Zhang used the phrase “充分借鉴吸收” (fully considered and absorbed). The language of the interpretation maneuvers around Article 5 of China’s Security (Guarantee Law) and Article 172 of the Property Law and their restrictions on independent guarantees in domestic transactions, because independent guarantees have grown to be a big business among domestic financial institutions (according to Judge Zhang) (The interpretation allows parties to agree that the provisions of URDG 758 will be applicable.). A guarantee contract is an ancillary contract of the principal contract. If the principal contract is nullified, the guarantee contract shall be null and void accordingly. Where it is otherwise agreed in the guarantee contract, such agreement shall prevail. Similarly, the Property Law states that “for the creation of a security right, a guarantee contract shall be concluded in accordance with the provisions of the law and other relevant laws. A guarantee contract is an ancillary contract of the principal contract. When the principal contract is nullified, the guarantee contract shall be null and void accordingly, unless otherwise stipulated by law. The interpretation tightens the fraud exception from the requirement to make immediate payment and specifies the conditions under which courts can issue stop orders. The SPC looked to the international agreements mentioned above, foreign legislation, and foreign cases when drafting its own provision (Article 12). Judge Zhang admits that the misuse of this exception by local courts has led to foreign banks being reluctant to negotiate letters of credit issued by Chinese banks. (This observer suggests that one reason could be that large local companies may pressure local courts to so rule). representatives from the principal Chinese banks and major state-owned companies. According to an “authoritative person,” the above list is not exhaustive. From my own contacts, and from reports of at least one conference on trade finance in Beijing attended by representatives from the ICC and the SPC, there were discussions with the ICC. SPC judges organized research and met with financial institutions. But Judge Zhang also said that they sought public opinion through the SPC’s website. What he did not say was that the consultation period was for nine days (as I noted in my blogpost of almost three years ago). As I said then (and have said numerous times on this blog and to individual SPC judges), my view that it is best for the SPC to solicit public comments on important civil/commercial issues such as this one and give persons a reasonable comment period, and for bilateral investment treaties to incorporate a requirement to require this. For anyone involved in any aspect of a project in which a Chinese contractor provides a demand/independent guarantee, reviewing this judicial interpretation is crucial. I expect the commercial translation services will translate it (and law firms, Chinese and international, will issue alerts parsing its provisions). This entry was posted in foreign-related cases and tagged Demand guarantee, Uniform Rules for Demand Guarantees.